Tape(1 pt. ), Rose red(35 pt. ), Packing(1 pt.). 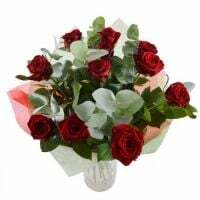 Birthday, Business, , Colleague, Condolence, For children, For grandmother, For her, For him, For young lady, Gratitude, I Miss You, Mother-in-law, New-born, Sorry, Teacher, Wedding Day, Wedding flowers, Аnniversary.